SkyPass is the frequent flyer program of Korean Airlines, a SkyTeam member. SkyPass is known for its generous release of premium reward space in first and business class cabins. Korean Air is one of the few remaining first class options within the SkyTeam alliance. SkyPass is Korean Air's frequent flyer program. As a SkyTeam member you can fly anywhere in the world using SkyPass points. SkyPass has their own U.S. branded credit card as well as being a transfer partner with Chase Ultimate Rewards and SPG, so the opportunity to earn points is very good. SkyPass is the only way you can fly Korean Air first class using points as other SkyTeam members restrict rewards to economy and business class. Best of all SkyPass is a very competitive program. SkyPass publishes multiple reward charts, one for travel on Korean Air operated flights only (not SkyTeam code shares), one for travel on SkyTeam and reward charts for other Partners. All reward charts are stated in points required for round-trip travel. They do allow one-way travel on Korean Air by paying 50% of the points required for a round-trip. All SkyTeam/Partner rewards must be redeemed as round-trip travel. While most frequent flyer programs have saver and standard rewards, SkyPass takes a different approach by offering peak and off peak rates. Peak rates are generally 50% more than off peak rates. While peak rates are obviously not the best deal, a 50% increase is better than most programs that double the cost from saver to standard. And a significant plus for SkyPass redemptions is the Peak Season dates for travel from North America to Korean are not very restrictive. Most of the Peak Season dates are blackout dates when redeeming Korean Air flights on other programs as well. Peak season days are determined by the date of departure from the origin leg. 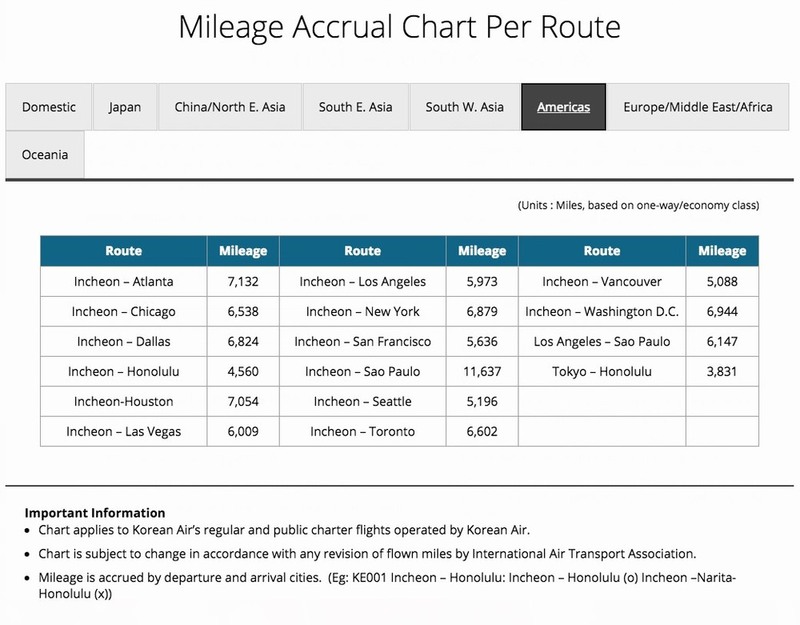 The Korean Air chart reflects travel through South Korea unless there is a 5th freedom route available. These routes are highlighted with a blue border. The most popular one for North American flyers is the Los Angeles - Sao Paulo Brazil route. Unfortunately Korean Air has announced this route is to be discontinued in the fall 2016. Otherwise you can fly from North American to Japan, South Korea and China for the same redemptions. You can't fly to Europe, the Middle East or Africa on Korean Air from North America on a single reward ticket. This chart is applicable to all 20 SkyTeam members. Only round-trip redemptions are allowed however departure/arrival can be open jaw as long as it's in the same country. For example; depart New York and return Los Angeles. Connections are allowed. Routing rules are explained below. When traveling within a specific country, many partners have different rewards than what's stated on the chart. For example if you are in France and want to fly within France, Air France has special redemptions. Regions are defined below. Click on the region you are interested in to see the reward variations located at the bottom of the chart under "Notes". Additionally you can fly Korean Air travel partners. To view the reward chart for each click on the partner; Alaska Airlines, Etihad, Hawaiian Airlines, Emirates, GOL and Jet Airways. Itineraries for Partner rewards require travel to be on the airline chosen. Additionally each reward is a single round-trip from point A to B and back. If point C is your destination then a 2nd ticket is required from B to C and back. For example flying Etihad to Male would require; US Gateway city to Abu Dhabi one round-trip ticket and Abu Dhabi to Male a second round-trip ticket. Exceptions to this rules are Alaska Airlines and GOL. Korean Air has a generous Round The World program available on Korean Air and SkyTeam Carriers. While the originating city and departure city must be in the same region, the origin city can't be a stopover on the return. So if you left from LAX you couldn't come back and stopover in LAX before heading on to another city, yet you could transfer (less than 24 hours). An additional 3 transfers are allowed which could be used to get to/from the gateway city. Change and cancellation fees are shown under Ticketing Costs. If you use more than one coupon the remainder is ineligible for a refund. SkyTeam blackout periods apply (China Southern). Only Korean Air flights can be booked on line. All other redemptions for SkyTeam and Partner rewards must be done via the call centers. Reward redemptions for SkyTeam and Partner airlines are a bit complicated. This form must be completed and returned to Korean Air. Rewards may be placed on hold by contacting the service centers. No hard/fast rule for the amount of time is given, yet consensus is about a week for SkyTeam rewards and longer for Korean Air rewards. That time period obviously depends on how far out the reservation is. Offsetting some of the reasonable redemptions rates are surcharges imposed on many Korean Air, SkyTeam and Partner rewards. Surcharges vary from city to city so it might be worthwhile to test a few before making plans. Surcharges appear to be the same for economy and premium class rewards. Out of all examples checked, both classes were the same. Like all reward tickets, additional taxes and fees are applied. The amount of theses fees are based on destinations. In these examples the ticketing and fees costs is generally around $90 for a round-trip ticket. Surcharges to many destinations; like Singapore and Sydney, can be significant. Korean Air has very reasonable change fees. Effective July 31, 2017 a request to change dates on a reward ticket is only KRW 30,000 or about $27USD. Until that time changes are free of charge. This applies to all reward tickets. Domestic flights within South Korea are and will be free of charge. If a change requires more points due to peak season then that balance is due. If part of a reward ticket is unused a refund for that portion will be given. Tickets are good for one year from the date of issue. However Korean Air will even refund your points for unused tickets after the year. The penalty is paid in SkyPass points and is applicable to Korean Air and SkyTeam rewards. After August 1, 2017: 500 points for a domestic ticket and 3,000 points for an international ticket. Based on a point value of 3 cents that is $90.00 for the international version. SkyPass has generous policy that allow a stopover on each one-way international itinerary. 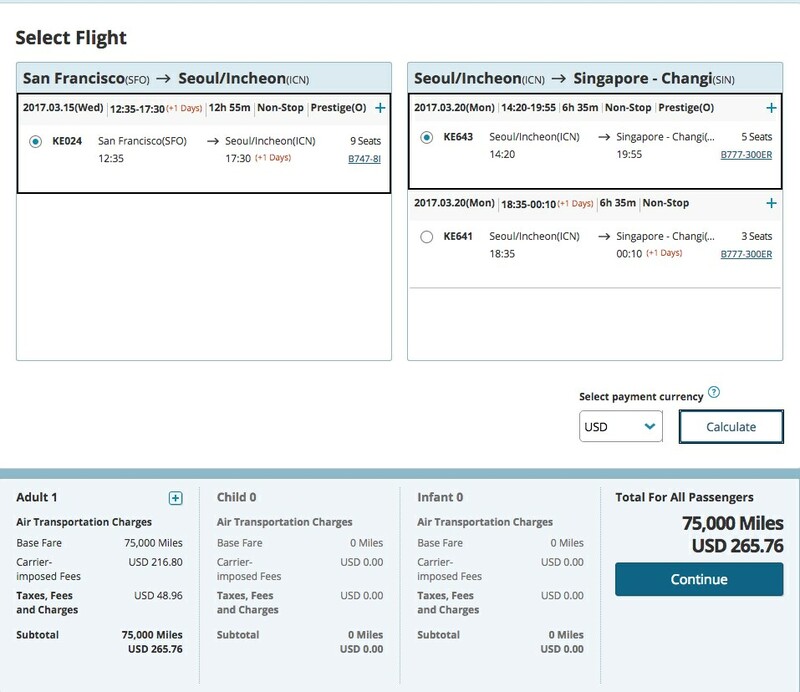 Since a one-way trip on Korean Air is 50% of the round-trip redemption, you simply book 2 one-way tickets using the Multi-City option as shown below. Doing this allows for an open jaw at the destination if you choose. This itinerary has 2 stopovers in Seoul and and open jaw at the destination, arriving in Singapore and departing from Kuala Lumpur. SkyTeam redemptions are for round-trips only. A one-way itinerary would be charged the same redemption. For SkyTeam rewards you are allowed a maximum of 2 connections to the gateway city, or 3 flight segments per one-way travel. A valid route would be JAX-ATL-JFK-CDG on Delta. You are allowed one stopover on a round-trip itinerary. You are allowed an open jaw that doesn't count as a stopover. You can not have additional transfers from the origin. If your destination is a city other than Seoul in South Korean it will require 2 reward tickets. For example if you wanted to travel to Busan, you would need your international ticket as well as a domestic South Korean ticket at off peak season redemptions of 10K points for economy or 12K points for business class. Korean Air has restrictions on who you can book a reward ticket for anyone other than the member's account where the points are coming from. There are two ways to deal with this. Create a Family Plan with Korean Air. The Family Plan allows you to secure a reward ticket for a total of 4 other family members. Family is defined as; parents, spouse, domestic partner, spouses parents and your children. You must register family members as well as submit documentation proving the relationship. For more information on how to register click on this link. An interesting benefit of the Family Plan is you can pool points from registered members accounts into a single reward ticket for any of the members. Oddly you can do this on Korean Air rewards and Partner rewards, but not SkyTeam rewards. For Rewards and Upgrades children require the same redemption as adults. Infants require 10% of redemption amount. The Korean Air website is one of the better and easiest to use search engines of all carriers. They offer two ways to find reward availability. You can enter a specific itinerary which requires you to log-in, or you may search for general availability on segments without logging in. The second choice, "Award Seat Availability" finds one months worth of reward availability on either one-way or round-trip rewards. The limitation to this search is it's individual segment availability. So searching for New York to Nadi you would need to do two individual searches. You can use this search without logging into your SkyPass account. However to view the details of any itinerary you must log in. The calendar shows days that no seat are available in yellow with a red bar and when no flights operate with a vertical bar. As you can see Korean Air has excellent reward inventory. You can also change the dates by moving a month forward or backwards. Click on the flights you want and click on "booking" at the bottom of the page (not shown here). Then you will log in. To search for itineraries that connect through Seoul you need to log in. From the main page click on Book A Flight and select "Award Booking" from the menu. Log in to continue. Enter your itinerary and class of service. My search has the return date of 3/21 and there was no availability. Instead of returning an error the search engine asks if you want to see flexible dates. Days not colored are available. Simply change your date to an available date, in this case 3/21 to 3/22. Next you can select from any options that might be available. Notice the 2nd return option has a layover in Seoul. (Hyatt is great place to layover). To change any criteria simply click on one of the tabs on top. Otherwise select your flights and move on. The issue was one of the flights did not have Prestige Class availability. It had First Class available. If this happens it's probably best to contact Korean Air at one of their service centers. To search for a reward with a stopover use the Multi-City function. For a round-trip ticket you'd need to do two one-way tickets or call the service center. To search for a multi-city reward simply check the box for multi-city and enter your destinations and dates. When searching multiple itineraries I ran across an issue with flexible dates and surcharge calculations. The surcharge increased once I selected the dates and moved on to the specific flight selection. If you live or want to travel to a gateway city that Korean Air departs to Seoul from North America, their redemption values are very competitive. 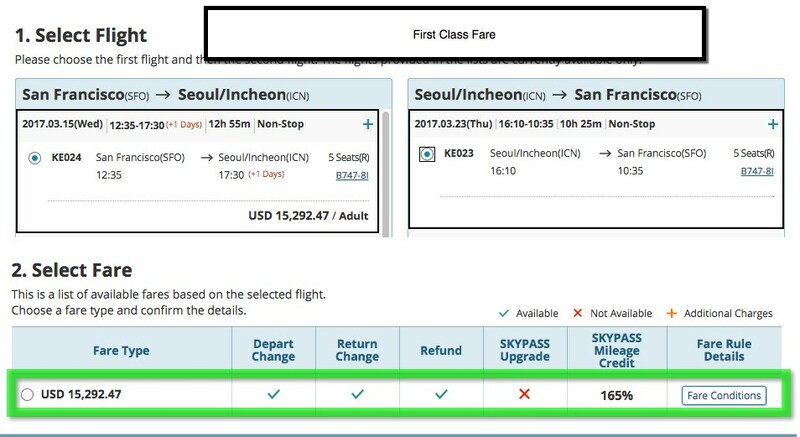 And if you want to fly Korean Air first class, using SkyPass points is about the only way to do it as Delta (SkyMiles) and Air France/KLM (Flying Blue) don't offer first class redemptions. Gateway cities are defined under Korean Air Region Definitions above. Comparing redemptions values to Seoul, South Korea against the other prominent SkyTeam partners as well as United, America and ANA shows Korean Air to be very competitive. While economy is 70,000 for almost everyone Korean Air has the best premium class redemptions. To Korea the surcharges are not that terrible (about $250) so this is a good option. While this chart shows ANA, those points are harder to accumulate and they charge surcharges as well. The other positive is Korean Air has incredible reward inventory, better than any of the other options. Redeeming SkyPass points for SkyTeam flights can also be lucrative. They have the best all around economy reward to Hawaii flying on Delta. Plus you can travel from most cities in North American. They also have excellent redemptions to Europe, but you will face surcharges. 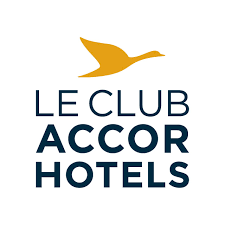 For 80,000 points round-trip that's significantly lower than all 3 domestic carriers and you can fly Air France or KLM. And they have great rates to lower South America, with the only issue being availability on Delta. Also round-trip to Africa at 120,000 points is incredible, KLM and Air France have good availability. Alaska Airlines: North America to North America (includes Alaska) 20K economy and 40K first. Also on Alaska you can have more than one flight, so you could connect in Seattle/Portland if needed and you get one stopover. Korean Air allows upgrade on all fares unless they are discounted more than 50%. Upgrades are to next class only. International fare codes that are upgradeable are J,C,Y,B,M. Upgrades are based on round-trip travel, however one-way can be upgraded at 50% of the required R/T points. Reward Off-Peak and Peak seasonality applies to upgrades as well as details on determining which season applies based on origin departure. That same cancellation and refund rules for Rewards apply to Upgrades. 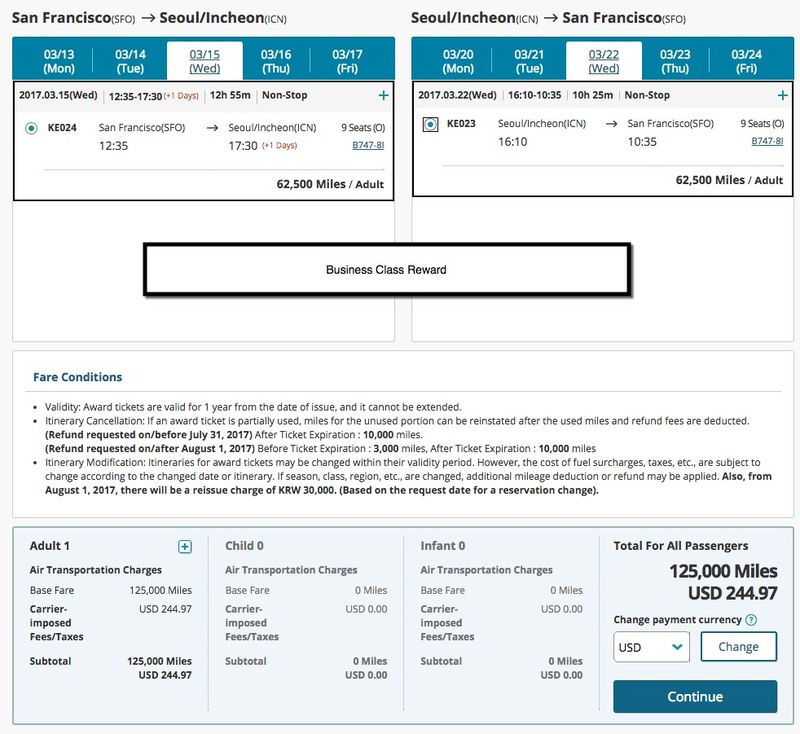 A fare purchase/upgrade and outright reward redemption is compared using a round-trip route from SFO to ICN. The days selected had availability for all classes using rewards or upgrades. A valuation on the SkyPass points was made at 3 cents. Unlike other programs you can't easily purchase SkyPass points. The only way is through SPG rewards. They charge 3.5 cents and only allow 35,000 per year. (They do have sales however to bring the cost down to about 2.75 cents). And since you get a 25% bonus when transferring 20,000 points I've used 3 cents as the benchmark. Of course earning initial bonuses on credit cards and spending means these points have less intrinsic value, making the upgrades/rewards more attractive. As indicated only certain fares can be upgraded. These are not the least expensive non-refundable fares. The upgradable fares were; Economy $2,155 and Business $6,519. The lower non-refundable fares were; Economy $849 and Business $3,769. The first class fare was a whopping $15,292 so anything will look good compared to that. In both cases it made more sense to get an outright reward, assuming you have the required points. The upgrade to Business Class would cost $561 more than the outright reward. And an even more significant $3,875 premium to upgrade the Business Class fare to First over a straight out First Class reward. Korean Air also allows for upgrades when you purchase fares for select Skyteam members. This is the upgrade chart for North America along with what the reward cost would be by itself. All other regions are found here. Korean Air uses a mileage and booking code based formula for awarding SkyPass points. Booking codes determine the percentage of miles earned as SkyPass points. When you select a fare from KoreanAir.com it clearly shows the percent you will get. Here is the chart as well as base mileage from North American cities. If you are connecting to another region or traveling to Seoul from that region, to see if how much your flights earn click here. Korean Air gives a generous 10 years before points expire. If you fly on a SkyTeam airline you can earn SkyPass points based on how the partner airline calculates points. Korean Air has numerous credit card partners in Korean and Japan and one in the Americas with US Bank. Use this link to get details on that program. Korean Air's transfer partners include Chase Ultimate Rewards as well as Starwood Preferred Guest program along with a couple of Hotel chain transfer options. You can not purchase SkyPass points from Korean Air or any other reputable source. Korean Air is a quality airline with a great SkyPass rewards program. The amount of reward inventory they release on most flights in all classes is possibly the most of any carrier. And if you want to fly First Class on Korean Air, SkyPass points are the only way to get there. With Chase Ultimate Rewards as a transfer partner getting points is no problem as well as having SPG as a transfer partner. Reward redemptions are at the low end of the all programs with the only drawback being surcharges added on to most tickets. Yet to Seoul and Tokyo these are minimal as well as to other select areas in Asia. Even with the surcharges the redemptions are great. If your plan is Seoul, this program is a must.